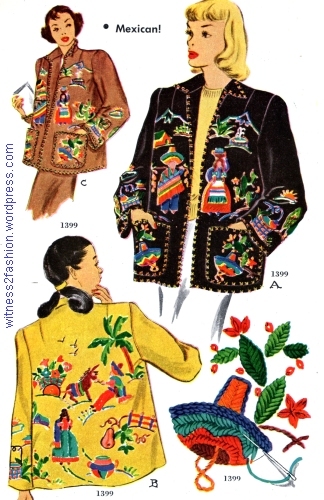 Embroidered “Mexican” jacket, McCall Pattern 1399. McCall Needlework Catalogue, May 1950. 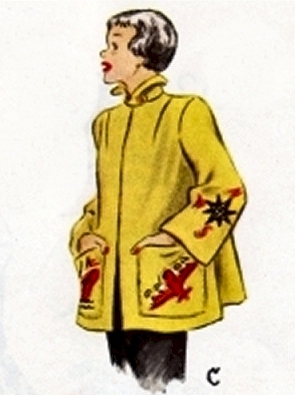 Someone in my family had a gold-colored embroidered jacket, very much like this one. I remember finding it, sadly moth eaten, while cleaning out an old wardrobe. 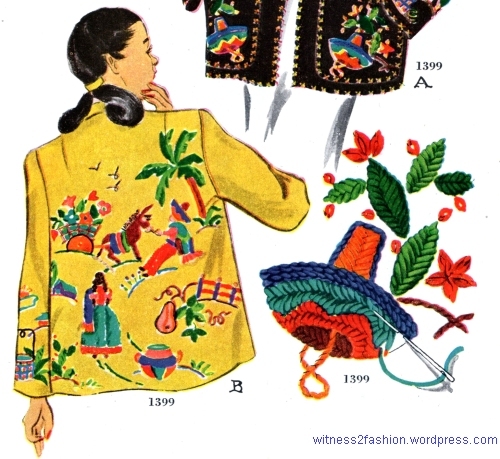 I hadn’t appreciated the enormous craze for these jackets until I looked up “embroidered Mexican jacket” online. Plenty of them survived and are available from vintage dealers. In fact, I found a few in the first vintage store I checked — Decades of Fashion, in San Francisco — and took a quick photo or two. This one was made in Mexico, probably brought home as a vacation souvenir. The very helpful clerk reminded me that, during World War II, the United States made an effort to form stronger alliances with our neighbors to the north and south, including trade agreements. In the 1940s, while the war made it too dangerous to travel to Europe and the Pacific (and with cruise ships turned into military transports,) Americans seeking vacations in exotic locations had an incentive to explore closer to home. Many tourists seeking warmer weather in “Sunny Mexico” discovered a world of brighter colors, brilliant flowers, beautiful embroidery, gaiety, and chunky, handmade Mexican Silver jewelry from Taxco. Unsigned, chunky Mexican bracelet, probably 1940s -1950s. Courtesy of RememberedSummers. 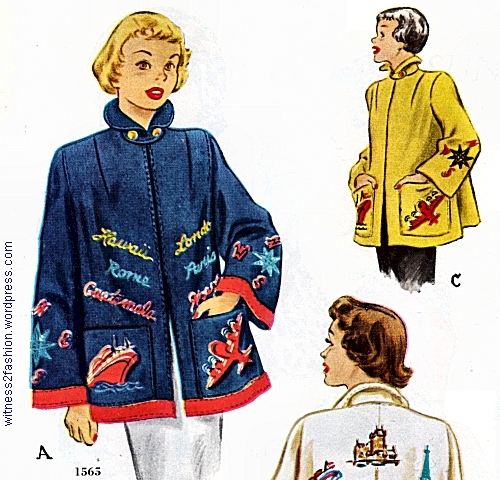 It’s surprising that McCall Patterns would offer several patterns for stay-at-homes who wanted to duplicate the look of souvenir jackets from Mexico, but these patterns for embroidered wool coats — usually unlined — were available for women, teens, and children in 1950. 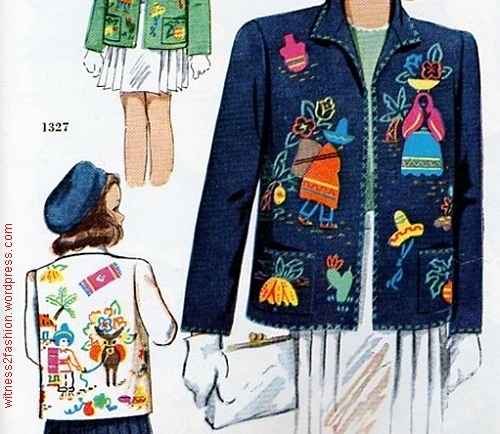 McCall pattern #1399, May Needlework Catalogue, 1950. 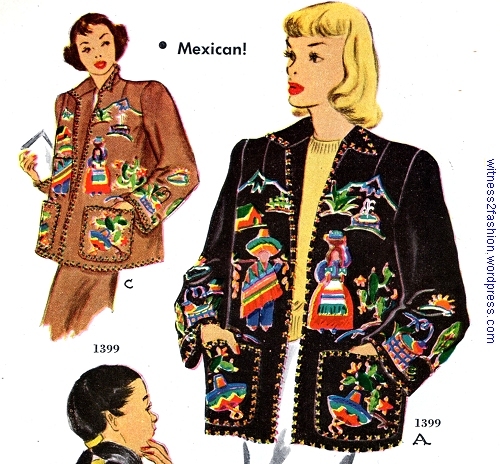 McCall “Mexican” coat pattern #1399, May 1950. Pattern #1399 description from McCall Catalogue, Dec. 1950. 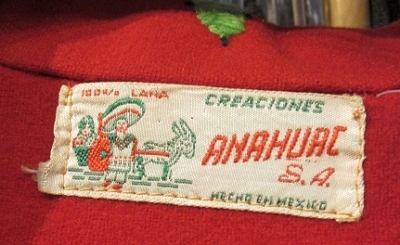 A narrrow hem stitched in two colors. 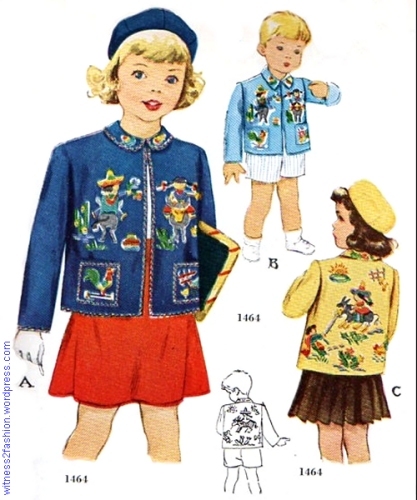 Pattern for Girls 6 to 14 years, McCall # 1327, 1950. I like the burro loaded with flowers on the back . 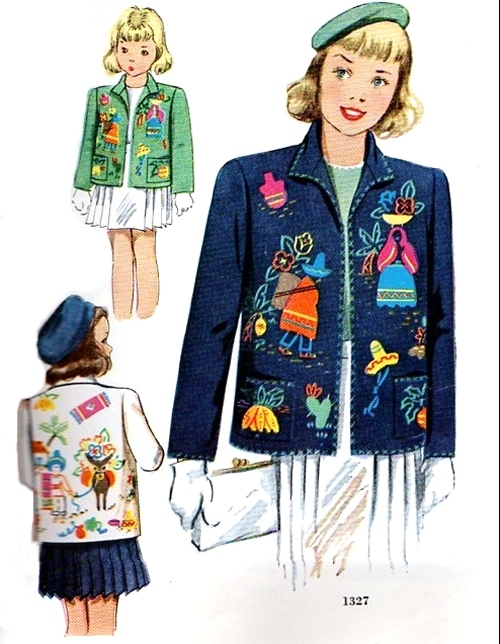 McCall pattern #1464, McCall Needlework Catalogue, 1950. That song was on the Hit Parade for months in the late 1940s. It was sung by Bing Crosby (and others) in 1948 and became a hit; then it was recorded by Perry Como (and others) in 1949 and became a hit again! 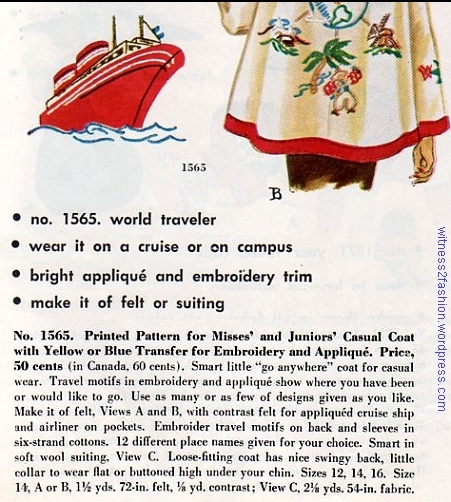 One reflection of this travel-lust was McCall’s pattern #1565, from 1950. 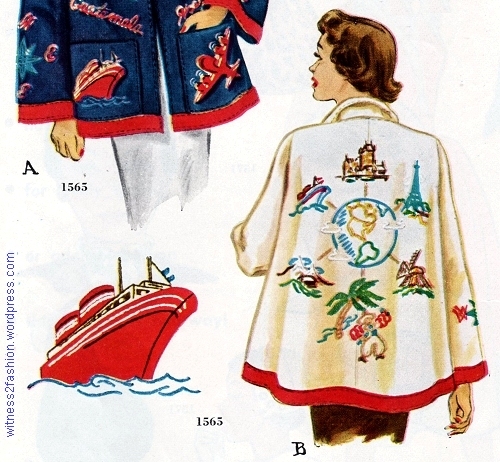 McCall “world traveler” pattern #1565, from 1950. It could be embroidered in cotton with the names of places you visited — or wanted to — or simplified, with just appliqued images of a plane and a ship on the pockets, and compass points on the sleeves. The “nice swingy” back could be covered with images of the Eiffel Tower, a Dutch windmill, etc. 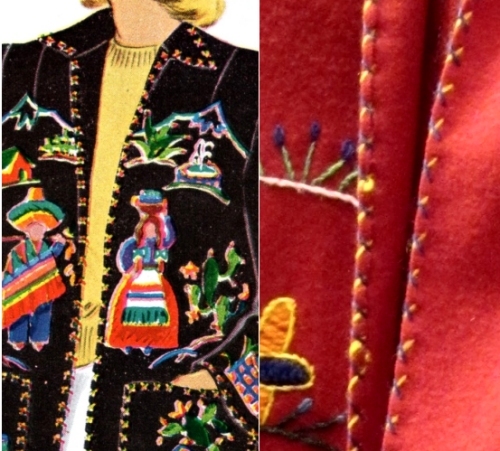 1950s Embroidered Jackets: Who Wore Them? “Wear it on a cruise or on campus,” says the pattern catalog. 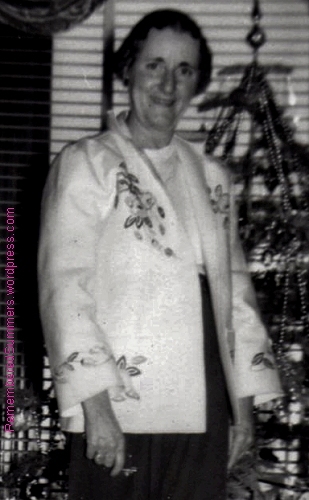 However, I suspect that these jackets were most often made as gifts, rather than by the woman who was going to wear them. 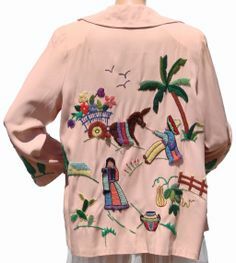 I can’t help wondering if the survival of so many embroidered Mexican jackets is due to an experience many travelers have had: The brilliant colors and “peasant” styles that feel liberating in their natural setting often seem loud or “costume-y” when you get them home to your normal, urban or small-town environment. This “world traveler” jacket — without the place names — looks chic and playful on the model. Would the version with the place names really help you to look sophisticated while sailing on the Queen Elizabeth? Or in Paris? 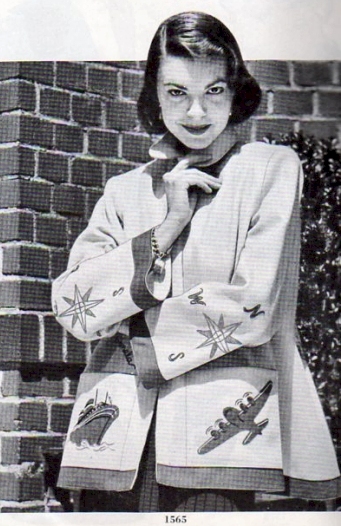 Woman in embroidered wool jacket, circa 1950 -52. She has not changed her 1930s hairstyle. Courtesy of RememberedSummers. Excellent theory about why so many of these jackets survived! When I was in college I lived right next to a Goodwill, which I visited all the time. I remember tons of these jackets. And at the flea market you could buy Taxco jewelry very cheaply. Not any more! 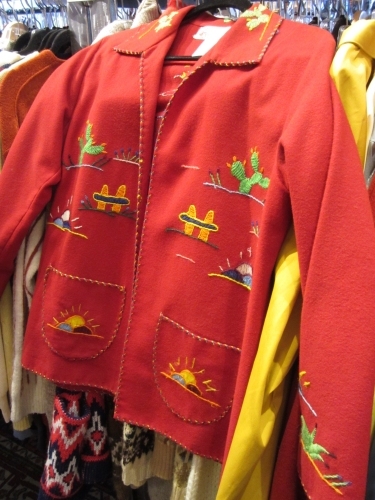 About those jackets: I have seen them currently priced over $200…. And, as Brooke says, not everyone has the flair to wear them successfully. Still, fun to look at! I’ve only known a couple of people whose personal style worked well for wearing this kind of garment without looking costumey. It’s a very specific look (more art than fashion) but so fun! This is one ’50s’ look that I will not be recreating (! ), but reading about them is fascinating! These were also available by mail order. I’ve seen lots of ads for them in magazines from the 1940s and early 50s. My gosh but that World Traveler jacket is incredible! My dad made my mother a jacket like this when he was in recovery at the VA after surgery – some kind of rehab to help with boredom probably. I used to wear the coat to school in the 70s. I gave it to my older sister so keep for preservation, but, do you know where I might find the pattern I would like to make one of them. You might try searching for the McCall pattern number on Ebay (which includes Etsy stores). I find that searching for McCall rather than McCall’s gets better results. 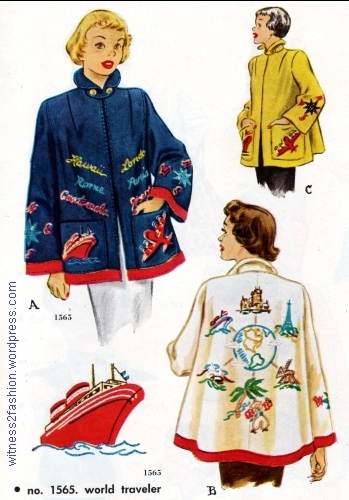 Other pattern companies probably also sold “embroidered jacket” patterns — perhaps a google image search would lead you indirectly to someone who has one for sale. That’s a lovely story about your father making a jacket that stayed in your family. Thanks for sharing it. 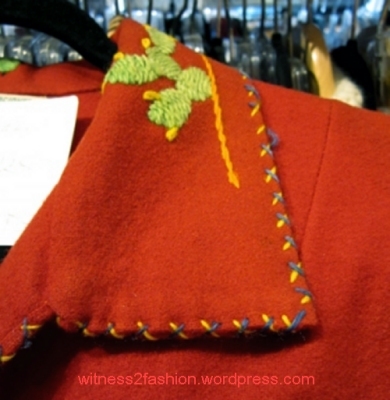 I made this jacket for myself when I was in Grade 8 1951 here in Canada it seemed to me that so many women were wearing them. I did a great job of embroidering, too! Good for you! It sounds like your early sewing experience was a good one.